Using outlook object model to send emails. Quite often it becomes necessary to send emails from applications that one develop. .NET framework provides multiple options for sending mails. For client side applications, using Outlook Object Model is the easiest one. This article describes how to use Outlook Object Model in C# for notifications. 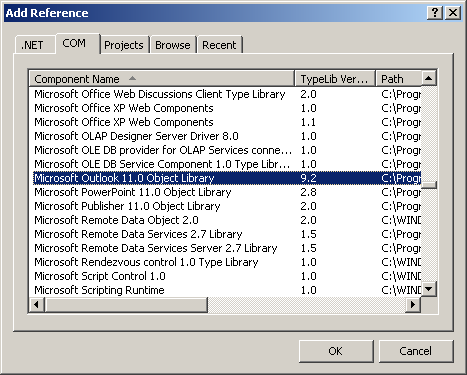 Within Visual Studio IDE, add COM reference to Outlook Object Library as shown in the below image. Rest of the code is simple and self-explanatory. 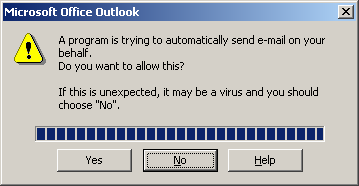 Depending on Outlook security settings, there might be a warning dialog box. If the user presses, “No”, it will raise a COM Exception. It has to be handled.